Azalea (Rhododendron simsii) is a shrub that grows to 2 m in height, with 2-3cm long leathery, egg-shaped leaves. The leaves are sometimes glossy, but practically all varieties have some bristly hairs on leaf edges. Blooms are carried in small clusters of two to five, each flower is 4-5cm across and may be single or double, sometimes with ruffled petals. The colors of blooms are white, magenta or any pink shade and sometimes they are attractively bicolored. Their blooms are often lasting several weeks. Synonyms: Euodia confusa, Azalea indica var. simsii, Rhododendron breynii, Rhododendron danielsianum, Rhododendron decumbens, Rhododendron hannoense, Rhododendron indicum, Rhododendron lateritium, Rhododendron macranthum. Common Names: Azalea, Indian Azalea, Sims’s Azalea, Florist’s Azalea. It grows well in bright light, but out of the direct sunlight. It grows best in a rich, organic, well-drained, lime-free acidic soil with a pH of 4.5 – 5.5. 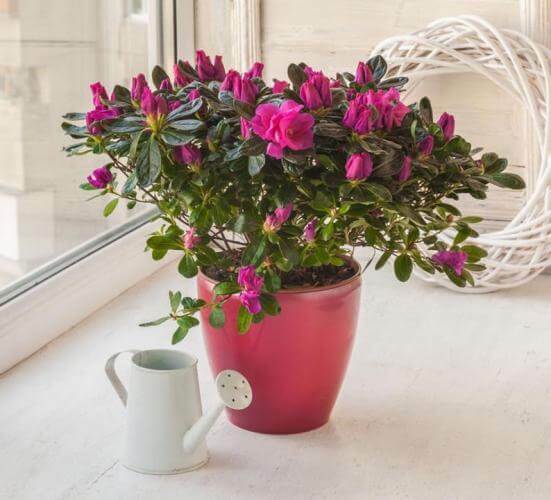 Water your plant regularly during the growing season and always keep the soil evenly moist but never allow your plant to sit in water. You can allow the top 1 inch of soil to dry out between each watering. During the winter months, water sparingly. It prefers cool to average room temperatures 60°F – 70°F / 16°C – 21°C. Fertilize once every two weeks from late spring to early autumn with a lime-free liquid fertilizer. Yellow leaves with green veins are a sign of a nutrient deficiency caused by too much lime. Cut the stems back, 1/4-inch above a leaf node. Use clean, sharp pruning shears to avoid tearing the woody stems. It can be easily propagated by stem cuttings. Take 2-3 inch long stem tip cuttings in spring and plant in a moistened rooting mixture consisting of two parts of coarse sand or perlite and one part of peat moss. Also can be propagated by seed, layering, and tissue culture. Azalea has no serious pest or disease problems. Sometimes, susceptible to infestation by spider mites and aphids.